Should You Upgrade to SSD? While PC shipments plummeted more than 6% in the first quarter of 2016, sales of SSDs mushroomed by 29%, amounting to nearly 31 million units sold. Solid-state hard drives offer increased speed, reliability and can save energy as well. The price of NAND memory used in SSDs is falling steadily. Today, you can buy a 120 GB SSD for about $40 at Amazon. That makes an SSD’s blazing speed, quiet operation, and energy efficiency very affordable. Many consumers are buying SSDs as system drives, and storing their data on traditional magnetic media. Samsung thoroughly dominates the SSD market with over 40% market share, and in second place is Sandisk, with 12.8% of Q1 shipments. Lite-On, which sells under the names Lite-On and Plextor, came in third with 11.4%. Kingston Technologies, the well-known DRAM maker, finished fourth in SSD shipments with 10.8% of the market. And now, here comes another formidable competitor: Western Digital, a company whose name is synonymous with hard drives. WD acquired Sandisk in May, 2016, and has been busy integrating the two firms’ tech and operations. The first fruit of this mating is just coming to market. 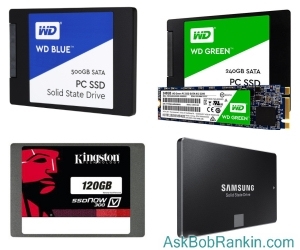 The WD Blue SATA SSD for PCs comes in three capacities and list prices: 250 GB for $87; 500 GB for $150; and 1 TB for $300. (Prices are significantly lower at Amazon.) The Blue reads data at up to 545 MB/sec. and writes at up to 525 MB/sec. The Blue SSDs also promise much longer lifespans than most competitors. The 1 TB Blue has an endurance rating of 400 TB written; in comparison, Samsung’s 1 TB EVO 850 SSD is rated up to 150 TBW. The Blue SSDs also claim a mean time between failures of 1.75 million hours -- almost 200 years! The WD Green SSDs are engineered to save energy. The Green SSD will be released by the end of 2016, according to Western Digital. It will come in 120 GB and 240 GB capacities. Pricing has not yet been determined. SSDs are predicted to continue their torrid growth. Prices will decline even further as sales volume increases, and as technological innovations such as 3D TLC (triple-level cell) enable more data in the same space. All mobile devices employ SSDs, and users have become accustomed to instant-on and rapidly responding apps. They want that speed on their desktops, too. When I bought a new desktop computer back in May, the first thing I did was order an SSD drive to replace the 500GB hard drive that shipped with my Dell Optiplex. I opted for a 250GB Samsung 850 EVO. It came with software called Samsung Data Migration, which made it super-easy to transfer everything from my existing hard drive, and make the new SSD my primary C: drive. The result was pretty dramatic. Startup time was reduced by more than half, programs open quicker, and everything just works faster. That's especially true when I have multiple programs and/or many browser tabs open at once. At current prices and capacities, I would recommend a solid-state drive as an excellent investment for any PC or Mac owner. I could have used my old magnetic hard drive as a place to store music or photos, but there's plenty of room on the SSD, so that wasn't necessary. I also thought about removing it and getting an enclosure kit that would turn it into an external drive for backups. But I already have two external drives. So the old drive is relegated to the task of storing nightly clone backups. If the SSD should ever fail, I would simply unplug it and boot up with the other drive, with little or no data loss. Of course, I also do weekly image and nightly incremental backups to an external hard drive. See my ebook Everything You Need to Know About Backups http://data-disaster.com/ to learn why I keep multiple redundant backups, and how to implement a backup strategy of your own. Most recent comments on "Solid State Drives Are The Future"
I bought a 400GB Sandisk SSD and installed it along with the standard HD, putting the operating system and programs on the SSD and using the HD for data. Worked fine until Win 10AU which wouldn't install no matter what I tried. Finally disconnected the HD and Win10AU installed correctly. Very odd. @stevekozzy to "get rid" of Microsoft edge, you can change the default browser to your choice. Click Start > Settings > Default Apps > under Web browser click on Microsoft Edge then change to your choice. You can disable Edge Browser in Settings and select IE or any other Browser as default. When checking email I use Google Chrome as the window is set up the way I like it and text can be enlarged by holding down the control key and pressing the + key as many times as you wish to enlarge it. make it smaller Control - (minus). Firefox works the same way. IE sometimes crashes and you have to reload the page. Thank you, Bob! This article came just in time as I will soon be looking for a new system drive to replace my old 74G WD Raptor drive that I have been using for over 10 years in two different builds. Defragging an SSD is not recommended. I've looked up TRIM and would like to erase deleted things to clean it up but have not found enough specific info to be confident to do it. I've had my Sony VAIO laptop for over three years and it has an unidentifiable 256GB SSD that has been great up till now. Think the drive is slowing down. Would TRIMing help and where would I find out specifics very detailed specifics? I'd love to get a TB but I want to continue using Windows 7 Pro (I have the discs up to SP1) but am afraid if I reinstall on a new SSD Doing updates to win 7 MS will want to force win 10! Any suggestions how to get new SSD and not get stuck w windows 10? Pls don't say get windows 10. That's not what I'm asking. Thanks everyone. CAUTION: SSD's are great but don't store pictures, music, etc. long term unless they are powered. Over time they lose their charge/data when stored with no power. Got a new Lenovo laptop a couple of months back which came with an SSD. At first, I was a bit reluctant to embrace this, but Holy Cow is it fast! I am a convert! I have defragged a combined SSD and XD disk (my C drive). Is this likely to have caused any harm? I have since read that it's not a good idea. If one does not have the tech-savvy to install an SSD, where do you suggest I go to have this done, Bob? Anyone? EDITOR'S NOTE: Your local computer repair shop, office store or electronics store would be a good place to look for that service. The tip by JC on longterm storage is crucially important. Additionally, I build custom machines for demanding applications. CAD/CAM and pro level video productions. I've build machines which lasted 15 years using spinning HDDs. If SDD's last 5 years that's a minor miracle. About half of my SDD builds fail after 2 1/2 years. Also, you should always Disable, pre-fetch, super-fetch and indexing. Trim must, must always be on. If you have sufficient main memory, you should disable OS virtual memory/paging. I read about SSDs being a better performance improvement than adding memory, so I tried it and put my O/S on it and Wow!Cut my start up time by 1/3 and my CPU runs 15 degrees F less. My download speeds increased from about 5MB to high 20s. Another wow! It is well worth the $147 I paid for the 250GB drive. you haven't mentioned so I'll ask; on your mission critical systems, which are you using? personally, I use WD Enterprise (gold label) HDD's available up to 8TB. It's amazing how technology is changing things! Probably, by no later than five years, the HDD will be obsolete technology, and desktops and laptops will be sporting only SSDs with, possibly, 1 TB or larger capacity drives, right from the factory. Although, with the growing popularity of off-site data storage, and cloud based programs, such as Microsoft Office 360, it may be likely that we, as consumers, will not need any more built-in storage than, say, 350 GB, which would be more than enough capacity for the operating system, its future updates, and a few major programs. The future of laptops will be like HP's Envy series or Lenovo's Yoga line: ultra lightweight and ultra portable, and stripped of disc drives and audio jacks, and utilizing only several USB-C ports, an Ethernet connection, and two slots for high capacity Micro SD/SDHC/SDXC memory cards. The good old HDD will join CRT monitors, 2.5" and 5" floppy drives, CD-ROM/DVD-ROM burners, 56K fax modems, on-board sound cards and dot-matrix printers, to name a few, in Technology Heaven. However, computer and storage drive makers will need to develop easier and more reliable ways for end-users to permanently delete files and/or wipe SSDs, for security reasons, when they are ready to dispose of the machine. SSDs are the way of the future. SATA SSD's provide fantastic performance and the newer PCIexpress SSDs with the NVMe interface have much greater performance capabilities unhindered by the SATA 6Gbps limit. SSDs are only going to get faster and cheaper. Tracy: After the release of Win10 - and after she had installed it and then reverted to Win7 - I reinstalled Win7 from the original disks on my mother-in-law's PC when I replaced the HDD. There were no problems - no attempt to force the upgrade. Tracy: It just occurred to me: I don't know what brand your computer is, but my MIL's Dell came with just recovery disks - I had a separate, full copy of Win7 available to do the re-installation from. It's worth noting some older machines may need a BIOS upgrade to fully use SSD's. The refurbished Lenovo T61p I've fitted one to has the SSD working but needs new BIOS to get the full speed. Regarding the SSD drives, I was concerned when I read that they did not retain their stored data for long periods of time if they were disconnected from power. However, we do have some computers in our Production area, running Linux, that I have used the SSD units in, with great success. Those computers are only shutdown on Sundays, and they are not disconnected from AC power. There's more reader feedback... See all 26 comments for this article.